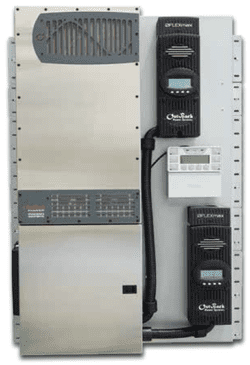 • The 4kW FLEXpower Radian (FPR- 4048A) is ideal for smaller power applications—including homes, cabins, remote communication sites and backup power systems. All-in-one package includes FLEXpower Radian (Radian Series inverter/charger, FLEXmax charge controller and MATE3), EnergyCell RE front terminal batteries and Integrated Battery Rack (IBR). Faster installation with a pre-assembled system and fully integrated GS load center can save up to a half day of labor. Pre-packaged systems available in two sizes offer an easy to order, simplified solution. IBR is designed to fit below the FLEXpower Radian. Advanced Grid/Hybrid technology allows for grid-interactive and stand-alone capability in a single unit. Overcurrent protection on each battery string for added safety and flexibility. 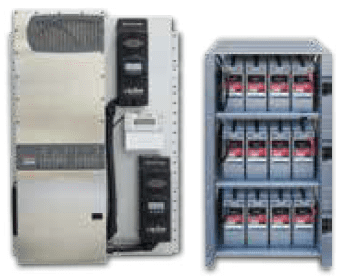 FPR-8048A-28.8kWh: Ideal for medium-power grid-tied with battery backup or stand-alone applications — including larger homes and light commercial backup power systems. FPR- 4048A-19.2kWh: Ideal for smaller power grid-tied applications with battery backup or stand-alone applications — including homes, cabins, remote communication sites with up to one day of autonomy.